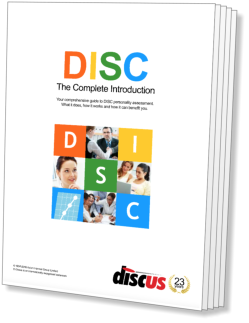 Understanding DISC I. The Theoretical Basis of the DISC System What is Personality? 'Personality' is a word with many different definitions - everybody has their own idea about exactly what it means, and there is probably no such thing as an absolute definition of the word. The purpose of this section is to define 'personality' purely in terms of the DISC profiling system. At the core of this definition lie the ideas of stimulus and response. Sets of circumstances or individual events (stimuli) cause people to act or react (respond) to them. Different people, however, have different responses to particular stimuli. In any given situation, we can expect that different people will react in different ways. In DISC terms, behaviour is defined as the sum of all a person's varying response styles to varying stimuli. Of course, in practical terms, it is impossible to measure and evaluate every one of a person's possible responses to every possible stimulus, and so different kinds of responses are grouped together into 'traits'. A trait is a tendency to act in a certain kind of way when faced with a certain kind of situation. We will see many examples of different traits as we explore the DISC profiling system. Note: In common use, the word 'personality' often includes a person's skills and abilities in its definition. This is not the case as far as the DISC system is concerned. Factors such as 'intelligence', or skills such as 'driving' or 'knowledge of zoology', are not properly part of a person's behaviour as far as DISC is concerned.